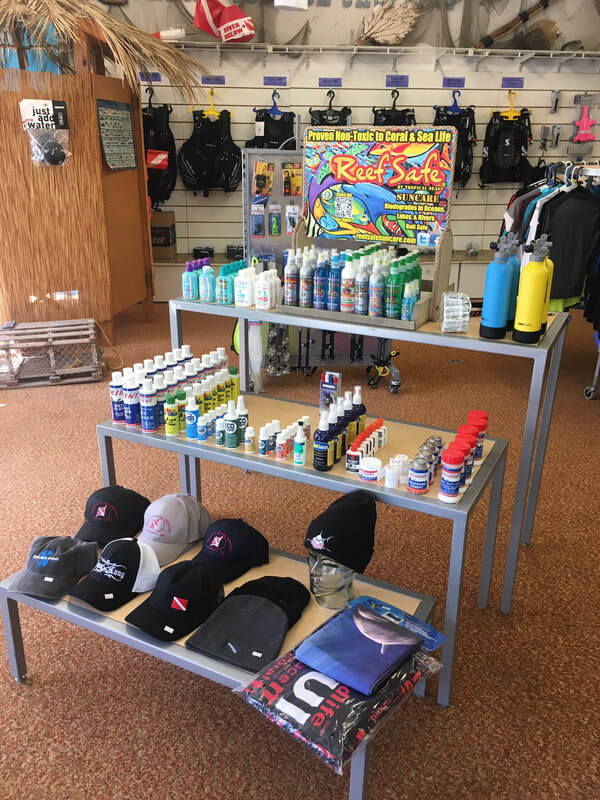 Scott's Scuba Service offers many services, training, and travel, but we are also western Pennsylvania's biggest Scuba retail store. *If we don't have it in stock, we can get it! We have 13 different styles of computers currently in stock! Scubapro, Aqualung and Mares. Within the next month we will also be carrying Shearwater! 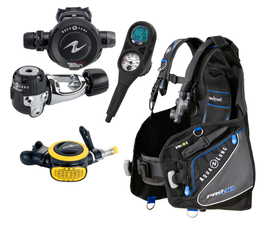 From the first time diver to an advanced Tec diver, we got you covered. We currently have 8 different styles with complete size runs here for you to try on, and the the new Aqualung rogue coming in soon! We carry all styles including standard jacket style, travel, back inflate, and wing/backplate. SO many wetsuits. We have a wide variety of neoprene in stock for you to try on in sizes from children's small all the way through 5XL. We also have every thickness from skins to 7mm, including shortys. In stock we have neoprene from Aqualung, Scubapro, Akona, XS, and Deep Sea. 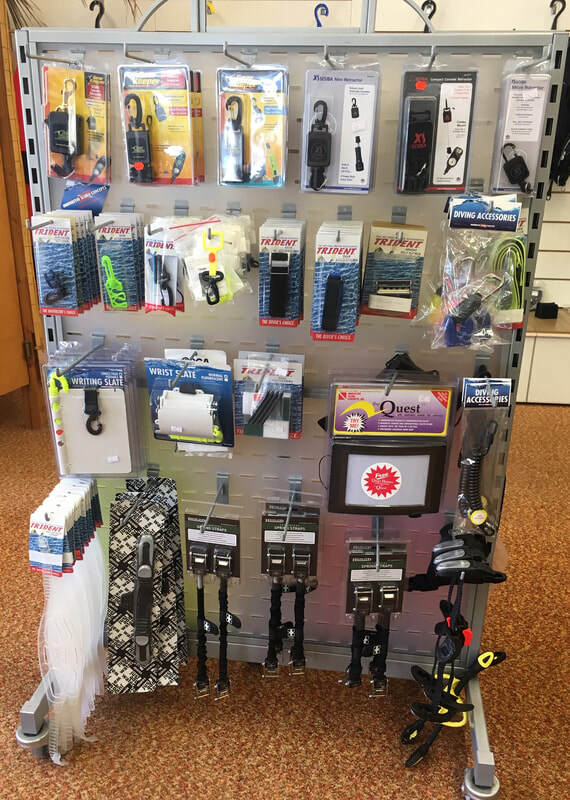 We currently carry Dive Rite products and are working on a dealership with Shearwater! We have backplates, wings, steel tanks, O2 regs, hardware, staging gear, canister lights, line reels, arrows, cookies, and more. We have Aluminum and steel tanks in stock, pony sized, 63cuft, 80cuft and 95cuft. We can get almost any size or pressure. We also have used. Along with the cylinders we have boots, caps, holders, plugs, valves and manifolds. Even if you aren't a diver we have snorkeling gear! Get your full face snorkels or classic style. We have sizes for very small children through Xlarge! Many colors and styles. You can get a kit with mask, fins, snorkel, and bag; or buy each individual. We have more than 25 styles of masks in stock! From the most basic black skirted to the fun colors and wide open side panels, or even frame less we try to carry every style and brand including Aqualung, Scubapro, Mares, XS, Dive Rite, and Deep Sea. We also carry a huge selection of neoprene mask strap covers, replacement straps, mask bags, and defog. Colors, wave guards, dry valves, roll up, and full face, and apnea. We have every type of snorkel out there in a variety options. We carry many styles of fins. Including swim, snorkel, Jets, basic paddle, travel, bare foot, and lots of soft kicking options. We have full size runs and many color options in stock for you to try on. Flashlights Galore! We carry a number of brands and styles of lights. Tank markers, handheld, canister, rechargeable, plastic bodied, metal bodied, dimmer switches, and pistol grip style, and others are all available in stock and in different color options. The Princeton tec lights even come with a lifetime warranty! We have plenty of knives for you to see while shopping in our store. From the smallest to the largest. We have both stainless steel and Titanium as well as BCD mounted and leg straps. For divers, snorkelers, swimmers, kayakers, water sports enthusiasts, or even just beach walkers, we have rashguards! With SPF and quick drying materials these are a must for anyone going into the sun. We have TONS of styles and colors in a size range from XS-3XL. We have tight fit and T-shirt style/loosefit. At Scott's Scuba Service safety is our top concern. We carry visual, and audible signaling devices, Spare air, pocket mask, snorkeling vests and a few other things to keep you safe in the water. We carry in stock a full size run of multiple styles and thicknesses of boots, socks, vests, hoods, and gloves. Including the thinnest of Lycra socks to dry groves we got you covered. In stock we have a full size run of Scubapro Exodry and Everdry suits. We can also get in custom cut USIA suits. Including rescue and surface suits. We can also get in Aqualung dry suits. We have T-shirts, sweatshirts, and Jackets, and hats in a variety of sizes and styles. We plan to soon bring in many more options of apparel! We carry SeaLife's full line of cameras, lights, and accessories. 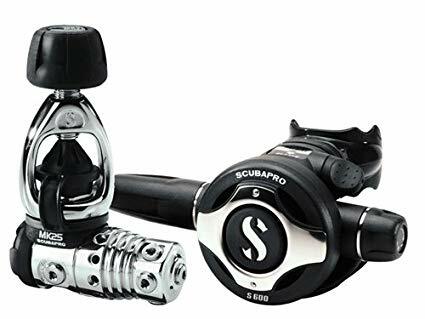 Scott's Scuba Service is now offering a Trade IN trade UP program for your used Scuba Gear! Have you been wanting that new BCD but not sure what to do with the old one? Or maybe the newest air integrated computer caught your eye but you wish you could get it a little cheaper? Well NOW is your chance! Bring in your used Scuba equipment and trade it in for new. -Each piece of used equipment will be quoted and valued on an individual basis. If you would like to get a quote on what we can offer you for your equipment before stopping in feel free to shoot us an email with details and pictures! *We will also consider out right purchasing used gear on a case by case basis. We offer Synchrony Financial 12 month 0% interest financing! Don't miss out on that new equipment you want, or trip you've been dying to go on. This same as cash offer is too good to miss out on. Scott's Scuba Service strives to help every diver get as much out of Scuba as possible. A huge part in becoming comfortable in the water is having your own equipment. We understand how expensive that can be for new divers, especially if there are multiple divers in one family! 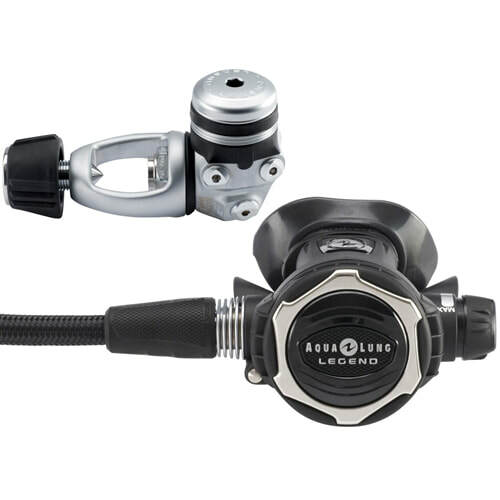 So working together with Aqualung we can offer you a gear setup with great quality, at a rock bottom price. Website by Inward Vision Helping all of the greater Pittsburgh Area DIVE!